The WEB-FAN Airius Air Pear fan is a wirelessly managed destratification fan. These fans form the foundation of Web Comfort Thermal Equalizer System that reduces energy consumption by increasing the efficiency of heating and cooling systems. Stratification, or temperature layering, occurs when there is minimal air movement within an enclosed building space. Heat (naturally or artificially generated) rises to the ceiling while cold air sinks to the floor. Temperatures can increase up to 1°F per foot of building elevation. In cold weather, destratification redirects hot air from the ceiling to the floor, recycling existing heat and reducing energy consumption. In moderate or warm weather, destratification reduces temperature differentials within the space and increases the efficiency of HVAC systems. 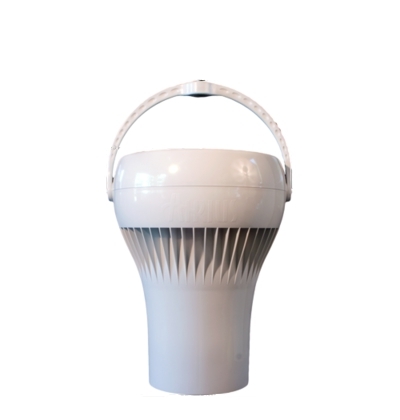 As a network device, the WEB-FAN Airius Air Pear is controlled by Web Comfort software. This software manages the speed, direction and run-time of destratification fans based upon schedules and demand response requests.